Mashed potatoes are one of the easiest comfort foods around. Since potatoes are literally my favorite food in the whole world, I typically mash ten pounds of potatoes ahead of time. Yes, the peeling is a time commitment, but if I’m lucky and hide some of the extras in the freezer, we have some for another meal. My goal is to eat some, save some for later in the week, and then freeze some, but I won’t lie to you, the seven in our family devours these. You really can’t mess up mixing of mashed potatoes, especially when you add lots of yummy goodness. 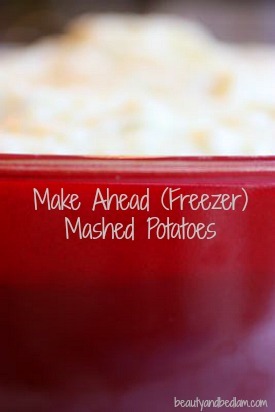 This make ahead mashed potato recipe is perfect for all your large group entertaining. It helps take the time consuming prep work out of the event day, and allows you do it to ahead of time. This is a great option for large groups since you have the option to make them up to two days ahead or time and just store in the fridge. (Just to give you a heads up on this recipe. I will give you my basic recipe, and then you can experiment based on your favorite flavors, since I rarely make them identical. There are so many options. 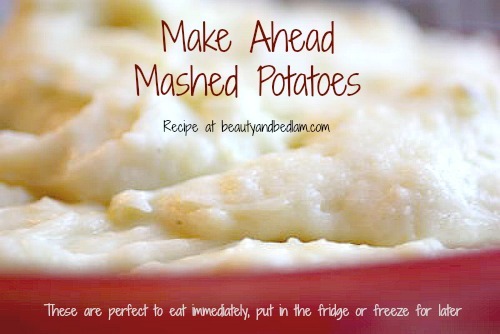 Summary: Make Ahead mashed potatoes is one the best ways to feed a hungry group. These Mashed Potatoes are a true comfort food. Peel and then boil potatoes till fork spears them easily. 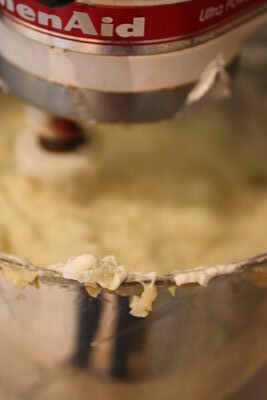 Mash potatoes by hand, beater or potato masher, but never use a food processor or blender as this will lead to over mashing (another leading cause of gooey potatoes.) Add in all ingredients. Spread in 9×13 baking dish. Either refrigerate for later, freeze, or bake immediately. Uncover, add a few pats of butter to the top and bake an additional 20 minutes or until thoroughly heated (heating time will vary). 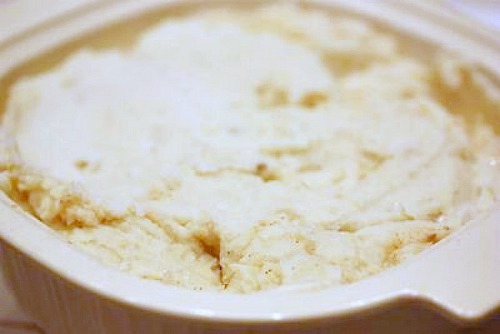 (If mashed potatoes were refrigerated, let stand at room temperature first.). If they were frozen, take out night before and thaw. Crock Pot Directions: If you need oven room, replace baking with crock pot option . If mixing by hand, just do everything in the crock pot with only one dish to wash. Follow the directions, but instead of baking, cook in crock pot on low 2-3 hours (or 6-7 if needed, yes, sometimes I’m gone all day and it’s necessary). Add in a few extra tablespoons of butter and a bit of milk for creaminess. Once you get the hand of Gourmet style potatoes, begin experimenting. If I make them for my family, I typically try and make them low fat, so instead of using butter and cream cheese, I may only use a little warmed milk (cold will make it gluey) and light sour cream. Yes, I completely eliminate the butter and just season them with french fry seasoning. Add just enough liquid to make a smooth mixture. My extended family are huge grilled onion fans, so I will saute onions in a little butter, and add that to the mix. Bacon, garlic, green onions/chives are also huge hits. Whatever you decide , the key is to add them quickly, and do all the mixing before your potatoes get cold. Freezer Directions: Place in freezer bags or alternative freezer dishes.They will freeze well up to six months, but make sure you fill up the bag or dish to avoid leaving additional air space which leads to freezer burn. Two options for reheating – Thaw and heat in microwave, stirring every few minutes until completely mixed, or thaw and bake in oven for 30 minutes. Please note that after they are thawed they will look really watering and you will panic. 🙂 This is normal. As you stir during the microwave process, they will come back to their original consistency, which is the same with baking. I did pour out a bit of the water first, but as it reheated, it was perfect by the end and I even then added more sour cream and sprinkled cheese on top. Wow – how could such an easy recipe take so many words to describe. Are there any variations that I have left out? How do you all eat your mashed potatoes? I like my mashed taters with butter only and salt & pepper. No milk, just buttery goodness! It’s a bit more work but sooooo amazing – I boil the wet ingredients before mixing them in with the potatoes – it varies but could include any or all of the following; butter, milk, sour cream, cream cheese. I add salt and pepper to that too. I put it in a smaller saucepan along side the potatoes and bring it to a boil – making sure to stir so it doesn’t stick. I love potatoes any way they come, but something about boiling the wet stuff before adding it to the potatoes makes them all the more AMAZING!! Oh my goodness!! (mouth watering) Sour cream and cream cheese and butter… no wonder they are your favorite food. That sounds WAY too good!! Thanks for the yummy recipe! I try to go as healthy as possible: a little bit of butter and a little bit of milk, just enough to get the right consistency. My favorite things to add are garlic salt and chives. What is french fry seasoning and where can I get some?!?! Yum-O!! Liking the idea of freezing. Happy birthday by the way! First, I love your website! I’ve been following you since Thanksgiving and its always such an encouragement. We love potatoes too at my house, but I hate peeling and therefore do 10 lbs of baked potatoes. I then scoop out the insides and make mashed. Some stay mashed, some become twice baked and some become potatoes skins. The twice baked and skins get frozen for a quick dinner, snack, or lunch. They don’t last long so I often do 20 lbs at a time especially when I find 10 lbs for 99 cents. Blessings. Ahhhh, POTATOES!!!! The best food God invented!! I, too, love them any way I can get them…..BUT, I’m lazy – therefore, I always leave the skins on…..even if I’m mashing them – my excuse is: “all the nutrients are in the skin, so why bother peeling it off!” I just found your site and can’t wait to come back often to see what you are up to…..
can i cook the potatoes in the crock pot or just do the final step. also, have you frozen them in freezer bags…or what do you use? @michelle, You can cook the potatoes in the crock pot but this recipe would have to be altered a bit. I freeze them in freezer bags, or my freezer Tupperware type plastic. Bags work really well and you can divide them based on amount you desire. I don’t care for sour cream or cream cheese, especially in my mashed potatoes. My husband would probably love these though. I grew up on my Grandma’s mashed taters and gravy. Since they were made to accompany gravy she just made them with milk and butter. I’ve since branched out by adding garlic salt and black pepper, occasionally crumbled bacon and french fried onions on top. I just can’t get over the “tang” that the cream cheese especially adds. All that to say, do you think if I made it the way you make them for your family, trading the lite sour cream for butter, they would turn out alright? thanks! I just had no idea that potatoes could stand up to being frozen and reheated this way. For a while now I’ve used the double boiler method for keeping them warm, but I always thought they’d dry out in a crockpot so never tried. Thanks for the tips. I use basically this same recipe (without the shredded cheese) for Thanksgiving dinner. I make them ahead and freeze, then a day or two before Thanksgiving I pull them out and let them thaw in the fridge. Then I put them in the Crock-pot, dab a little butter on top of the potatoes and warm them that way. They come out really good. The first time I did it that way, they were soupy at first, then they firmed up as they got warmer. I wonder if the cheese would still work in there? I LOVE cheese! I have a LOT of potatoes from last year that are in a bucket, under my counter, sprouting like crazy. I think this may be the perfect thing for them. WhooHoo! Russett potatoes are on sale 5# for .99 AND I’m starting a part-time job next week. I need to batch OAMC some things for the freezer. Question: you have listed 10 potatoes. Do you really mean 10 potatoes (which could vary greatly in size) or 10 pounds of potatoes? I took on the task of creating a mashed potato martini bar (basically mashed potatoes served in fancy glasses with many different toppings to choose from) for a bridal shower for 60 people. (I need my head examined!) How many pounds of potatoes would you recommend I prepare for 60 people?? Would I be really crazy to try to make them all the morning of the shower? I’ve made this recipe, just with a few variations, for 30, using instant potatoes. So two large boxes of instant potatoes, cooked according to instructions on the box. When they’re done, add 1/2 a pkg of cream cheese to each (you can add a whole to each if you like. The taste doesn’t change but the consistency does). Then I add 4 oz of sour cream because my husband doesn’t like sour cream, which I think most of the flavor comes from. I put all this in a crock pot on low or warm, according to how long they stay in there. I add 1/2 stick of butter to the top and let the crock pot do the rest. This is the easiest way to make large quantities. Every time I’ve made these, they are gone before I get some. Ha. And I get requests to bring them when we have dinners. I just read what I wrote and I need to clarify. One large box makes @30 servings, so 2 large boxes would make @60. They don’t look all that great when you put them in the crock pot, but after they’ve cooked in there for awhile, they look marvelous, but you’d need to stir them up before serving. If you put them on low, check them to make sure they aren’t getting crusty on the edges. I would also spray the crock pot with Pam or whatever you use like that. I always forget to do that. ha. You would need two large crock pots for two boxes. I like the idea of adding sour cream, haven’t done that before. I sure would like a better recipe for instant potatoes. It seems like the best smashed potatoes comes from the hard work of peeling real ones. I use a similar recipe for make-ahead mashed potatoes. 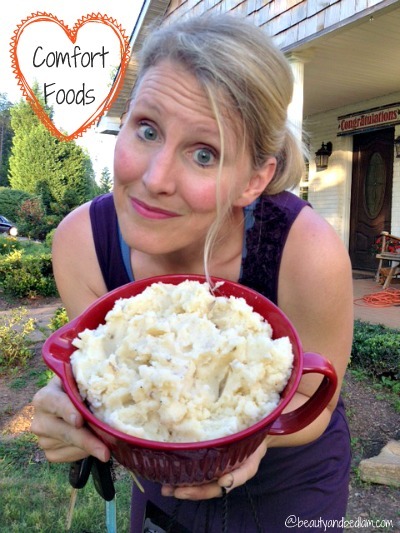 I love mashed potatoes, and I also love it that they can be prepared ahead of time! POTATO LOVERS! Sure glad to know that there are others who also love potatoes so much!! We live in Vermont and my favorite day of the year is the one Sunday in September when we pick our own potatoes (about 500 lbs) behind the digger at the Chappelle farm in Williamstown. The 2011 price for “Reba” round white potatoes was only 30 cents per pound! @Jen, ALMOST to the most wonderful day of the year!! They’ve started offering fresh french fries made right there at the field also! Can’t wait to bring my 14 mos old grandson this year. He can help pick potatoes and eat some fantastic french fries. Just doesn’t get much better! I didn’t mention that some of our kids have also earned money at the field picking up the potatoes that nobody coming in to pick chooses. They fill a couple of buckets at a time and then get them up into the truck. Hard work, paid by the bucket (they keep a tally as they go) and they might get $75+ for the day, all depending on how quickly you can keep going for the day. My question is: how many people does this serve? Ruth – I guess it completely depends on if your family members are huge potato lovers. Typically, people might say 1 potato per person, but I’ve found that these go SO quickly, I try and think 2 potatoes person. I always just make a ten pound bag because the leftovers are wonderful and it’s always nice to have more than not enough. Hope that helps a bit. Serving size varies so much family by family. Does it work the same if I leave the skin on the potatoes? My husband and I love the skin still in mashed potatoes but I want to make sure it doesn’t affect the ability to freeze ahead for later. I just got a kitchen aid mixer today after wanting one for a year, so today is of course, cook EVERYTHING day. I loved these, never thought to put cream cheese in my mashed potatoes, but I used fat free and lowfat sour cream and greak yogurt. This sounds delicious! I have a ton of potatoes just pulled that I need to use up or take to the cellar. If I’m going to freeze them, do I bake them first as the recipe calls for, then freeze, then reheat by microwave or baking again? You can do either really. Typically, I make them and freeze, then bake, but it wouldn’t matter. If it’s a bit on the thicker side after baking, I just add a bit of warm milk to bring back the creaminess. They are SO yummy. Made mine and they had a lot of whey in them when thawed and were runny. How do I correct this? Sorry that I am just seeing it? Were they fine once you mixed them up and reheated them? Mine always are.